Video yang digunakan oleh post sumber adalah hasil suntingan, kompilasi memotong video-video publikasi tahun 2013 dan 2014, diedarkan kembali untuk membangun premis dan framing “Pro asing”. Selengkapnya di bagian PENJELASAN dan REFERENSI. http://bit.ly/2CHVwtG, kanal YouTube “Jalal” (youtube.com/channel/UCeCBJqBgUfs_ReFwNsotz6Q). Video-video yang dipublikasikan di 2013 dan 2014 dipotong, lalu dijadikan kompilasi untuk membangun premis dan framing “Pro asing”, diedarkan lagi memanfaatkan momentum mendekati pilpres 2019. * http://bit.ly/2ROlhg2, Portal KBR @ 6 Jun 2014: “Hashim Djojohadikusumo”. * http://bit.ly/2NDLGdu, BeritaSatuTV @ 29 Mar 2014: “Prabowo Sindir Capres yang Suka Ingkar Janji”. 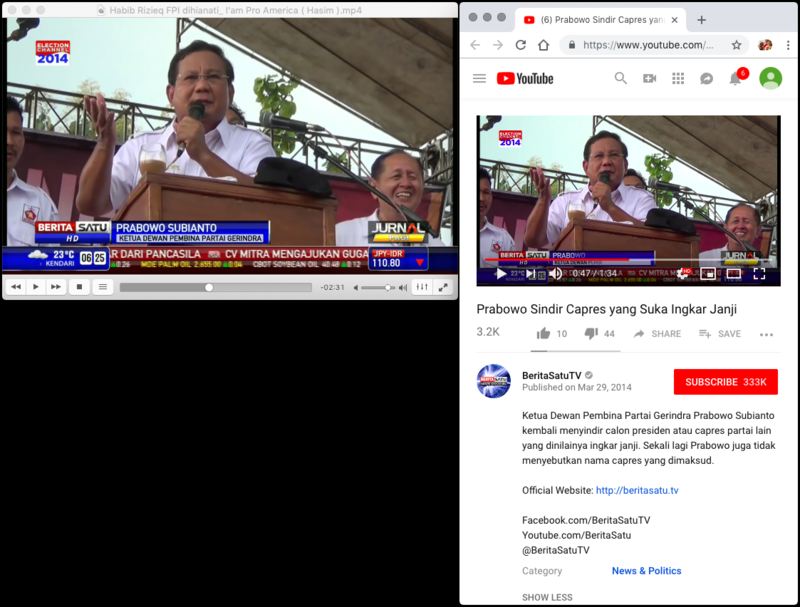 * http://bit.ly/2puky79, Tempo Politik Channel @ 22 Apr 2014: “Prabowo Subianto : Saya Ini Produk Asing”. 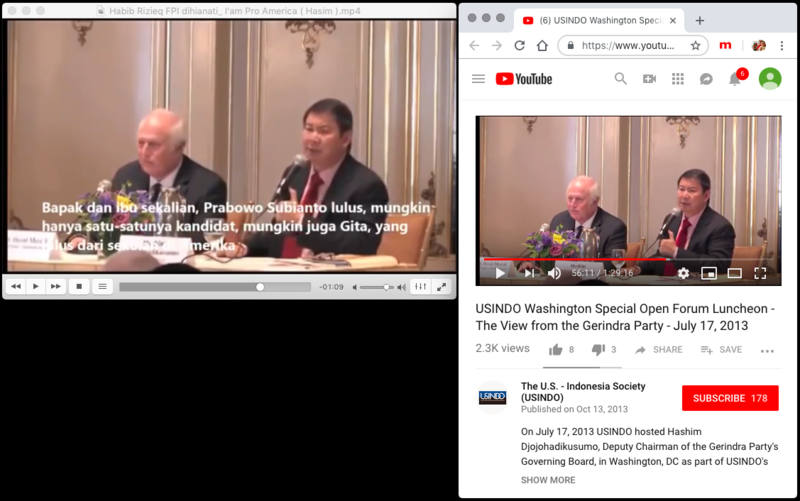 * http://bit.ly/2yJUAkj, The U.S. – Indonesia Society (USINDO) @ 13 Okt 2013: “USINDO Washington Special Open Forum Luncheon – The View from the Gerindra Party – July 17, 2013”. 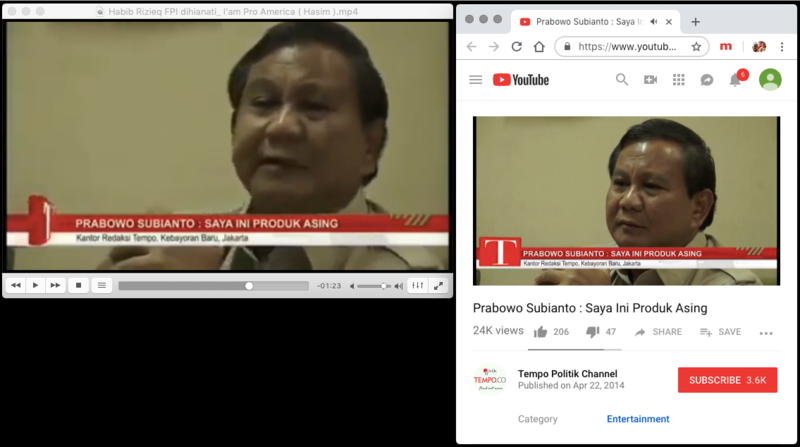 (1) [SALAH] Pemelintiran konteks video “Prabowo Subianto : Saya Ini Produk Asing”, post sebelumnya di http://bit.ly/2pqObGh. TRIBUNNEWS.COM, JAKARTA – Janji yang disampaikan oleh Wakil Ketua Dewan Pembina Partai Gerindra Hashim Djojohadikusumo bahwa Prabowo Subianto akan melindungi kelompok minoritas seperti Ahmadiyah dan Syiah diapresiasi. “Menurut saya itu bagus kalau mereka menyatakan itu,” kata Aktivis Muda Nahdatul Ulama (NU), Syafiq Ali, kepada wartawan di Jakarta, Senin (9/6/2014). “Kalau itu sudah terucapkan itu sangat bagus, itu penting untuk diapresiasi ketika berani diucapkan,” tambahnya. Menurutnya, komunitas-komunitas yang minoritas di Indonesia memang wajib mendapat perlindungan dari Pemerintah. Sebab prinsipnya adalah keyakinan apapun yang tidak melanggar Konstitusi dan tidak melanggar hak hidup orang lain akan layak dijamin oleh negara. Dia menekankan Indonesia adalah negara yang hidup berdasarkan Pancasila. Dan berdasar sejarah, sebelum Indonesia diproklamirkan, sudah banyak keyakinan yang berbau animisme dan aliran kepercayaan yang sudah lebih dulu hidup di masyarakat. Artinya, mereka tak bisa diberangus karena Konstitusi melindungi hal orang untuk memegang keyakinan. “Kita boleh berdakwah, tapi tak punya hak memberangus. Karena itu dijamin oleh Konstitusi. Kita tak boleh asal, bahwa aliran yang dianggap keliru harus dibubarkan. Sejauh tak melanggar Konstitusi dan hak hidup manusia lain, dia berhak hidup,” jelasnya. Meskipun demikian, Syafiq menilai janji itu pasti akan ditagih rakyat manakala Prabowo-Hatta menjadi pemimpin Indonesia. Sebab selama ini yang diketahui adalah bahwa Prabowo-Hatta didukung PKS dan PPP yang elitenya pernah menyatakan kelompok seperti Ahmadiyah harus dibubarkan. Diketahui, saat berbicara di depan jurnalis yang tergabung dalam The Jakarta Foreign Correspondent Club, pada Jumat lalu, Hashim Djojohadikusumo, adik Prabowo sekaligus Wakil Ketua Dewan Pembina Partai Gerindra, menyatakan bahwa Prabowo berkomitmen pada perlindungan kaum Minoritas seperti Ahmadiyah, Syiah, dan komunitas kristiani. Hal itu akan dilakukan demi menjaga pluralitas bangsa dan prinsip negara yang dimuat di Pancasila. “Kalian tahun bahwa saya penganut Kristiani, dan saudari perempuan kami menganut Katolik. Prabowo telah membuat sejumlah janji kepadaku dan saudari perempuanku (soal itu),” ucapnya. Jakarta. 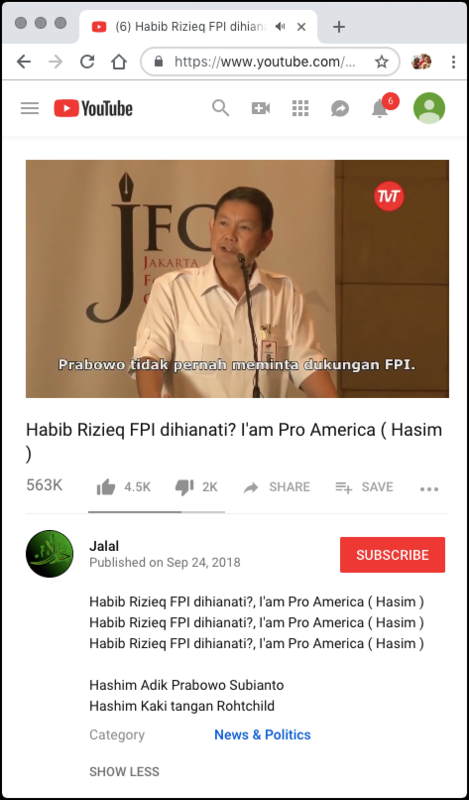 Hashim Djojohadikusumo, the younger brother and economic adviser to presidential candidate Prabowo Subianto, says that Prabowo is committed to the protection of minorities such as Ahmadis, Shiite Muslims and Christians in Indonesia, in a bid to maintain the nation’s pluralism and the philosophical foundation known as Pancasila. Hashim went so far as to say that Prabowo was committed to protecting Ahmadis, who in Indonesia have long been denounced and attacked by Sunni Muslim hard-liners. “He has been defending Pancasila and pluralism all his life,” he said, referring to his brother Prabowo, who is Muslim. Born to a Christian mother from Manado, and a Muslim father who was an acclaimed economist, Hashim spoke of diversity in his own family. “You are aware that I am Christian, and you are aware our sister is Catholic. Prabowo has made certain promises to me and my sister,” Hashim, 61, said at the event, which was attended by more than 200 people including international journalists and ambassadors. 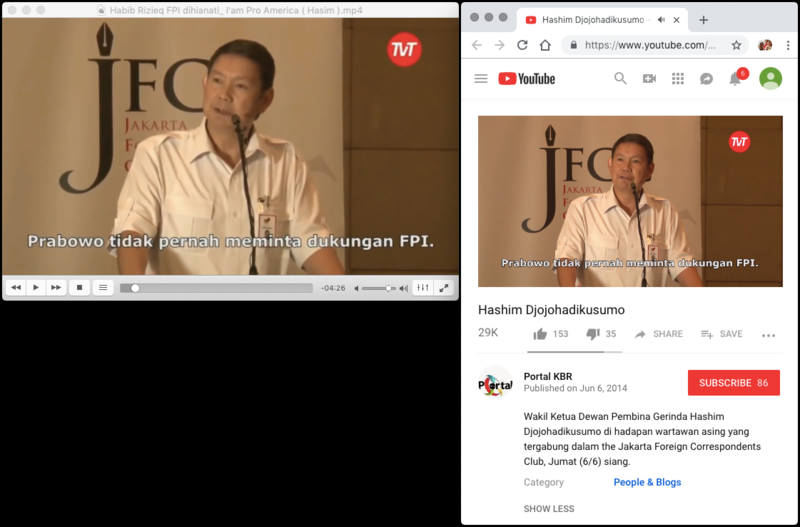 Hashim’s comments were made in light of overtures by Prabowo’s running mate, Hatta Rajasa, toward the Islamic Defenders Front (FPI). Prabowo’s commitment to uphold religious tolerance was seen as being severely undermined after Hatta was viewed as courting the FPI for support last week. Hashim denied that Prabowo actively sought support from the FPI. The FPI is a hard-line Islamic organization that has repeatedly attacked minorities such as Ahmadiyah, Shiite and Christian communities. It has also raided brothels and nightclubs in a move to root out what it calls immoral behavior. Hatta, who is the chairman of the Islamic-based National Mandate Party (PAN), last week attended a Muslim religious service in South Jakarta with prominent FPI members, where he asked attendees to give their support to Prabowo’s presidential bid. Indonesians go to the polls on July 9 to vote for the next president to succeed Susilo Bambang Yudhoyono, whose second five-year term ends in October. Prabowo’s Great Indonesia Movement Party (Gerindra) received nearly 12 percent of the legislative vote in the April 9 ballot, far less than the 25 percent needed for the party to nominate its own presidential candidate without the need to form a coalition with other parties. The Indonesian Democratic Party of Struggle (PDI-P) of main challenger Joko Widodo, the Jakarta governor, took in almost 19 percent. In response to media coverage of Prabowo, Hashim said he believed his brother had been portrayed unfairly by some Indonesian news organizations. 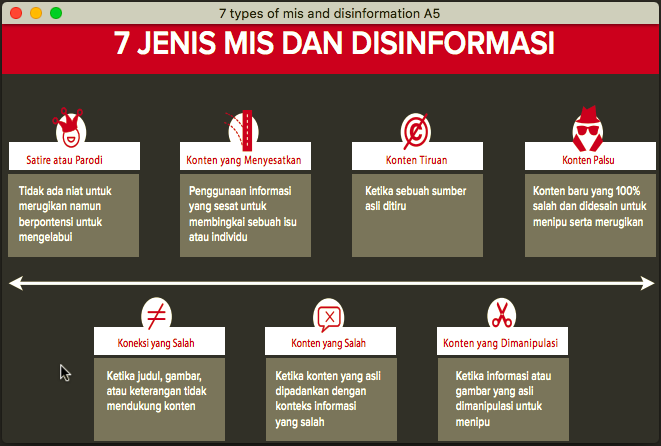 “Prabowo was misquoted, I suspect intentionally misquoted, by a few Indonesian media. Prabowo has never courted the FPI’s support,” he said. He also denied that the FPI would be a part of the current coalition that supports Prabowo. “I just want to reiterate that it is not our policy or intention to get the FPI as part of the coalition,” he said. However, analysts doubt Prabowo will really stand up for minorities in Indonesia. Arbi Sanit, a political analyst from the University of Indonesia is skeptical. “The statement shows Prabowo’s or Gerindra’s inconsistency. I doubt that [the commitment] is even real,” he said. Then there are those who wonder whether Hashim’s comments truly reflect Prabowo’s views. Some observers such as Yunarto Wijaya from Charta Politika aren’t convinced. “If you look closely, statements that support pluralism always come from Hashim. He is a minority himself, and he has an international background. Don’t be surprised if he sides with minority groups,” Yunarto said. 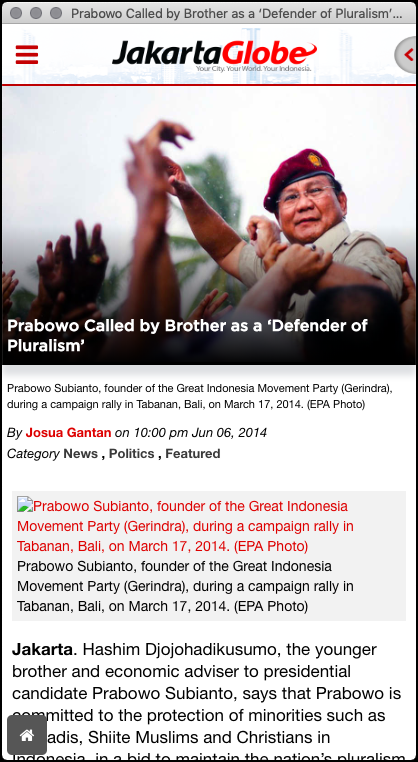 “Look at Prabowo’s political maneuvering. Does it support Hashim’s statement, or does it contradict it? “As long as Prabowo does not officially say that he will guarantee minorities’ rights, then Hashim’s statements are as good as meaningless,” he said. While Gerindra has prided itself as a nationalist party — which in the Indonesian context is understood as another way of saying that the party supports pluralism as opposed to the exclusivity upheld by the Islamic parties — its decision to ally with non-pluralist Islamic parties such as the PAN, the Prosperous Justice Party (PKS) and the United Development Party (PPP) has led many to wonder about its commitment to pluralism and protection of minorities in Indonesia. In this respect, Hashim admitted that Prabowo had made compromises, but he gave assurances that Prabowo would not turn against minorities. “We have to make tactical compromises, but we will not make any compromises on our basic thesis,” Hashim said, pledging that Prabowo and Gerindra were committed to upholding pluralism in Indonesia. Gerindra is particularly vulnerable to charges of being inconsistent due to the string of compromises that it has made. A journalist from the Sydney Morning Herald asked Hashim during the luncheon how Prabowo could be taken seriously as an anti-corruption figure — an image that the party has been trying to promote — if there were people accused of corruption in his coalition. Suryadharma Ali, the PPP chairman and one of Prabowo’s more ardent supporters, resigned as minister of religious affairs last week after being charged in a graft scandal at his ministry. Prabowo has publicly defended him, calling Suryadharma “the best religious affairs minister” in Indonesia. In response, Hashim reminded the audience of the presumption of innocence, saying that there shouldn’t be a rush to condemn Suryadharma, who has not yet been indicted. Hashim also added that Gerindra did not have much of a choice and that it acted to be practical. “Politics is the art of the possible. Sometimes we have to make tactical, unintended compromises. Let’s be realistic — Gerindra only got 12 percent of the legislative election,” he said. He explained that with its meager share of the votes, Gerindra did not have the luxury of choice and had to be content with its current cast of coalition members to meet the 25 percent threshold requirement to name a presidential candidate. Hashim compared Prabowo’s pragmatic approach to Lee Kuan Yew, Singapore’s former prime minister, who built up the city-state into the leading financial center in Southeast Asia. “Look at Lee Kuan Yew in the 1960s. He allied himself with the Malaysian communist party, the CPM [Communist Party of Malaysia]. Take a look now … by most accounts, Singapore is considered a capitalistic paradise,” Hashim said. Hashim also addressed questions about Prabowo’s poor track record on human rights. Prabowo has been criticized in Indonesia and internationally for his involvement in human rights abuses. He is alleged to have kidnapped and tortured 13 pro-democracy activists during the turmoil that led to the resignation of the strongman Suharto, who was his father-in-law at the time. The 13 activists remain missing. Hashim argued that Prabowo was only performing his duties as a military officer and that the abductions should not be deemed human rights violations. “He did not kidnap people. He detained people. Those were legitimate orders from a legitimate government at the time,” Hashim said. Komnas HAM has asked Prabowo to come in to testify more recently, but the former Special Forces commander has balked at the request. Regarding Prabowo’s economic plans, Hashim said the candidate would remove fuel subsidies gradually. Prabowo will also raise tax revenue by cleaning up the “corrupt tax system” and by ensuring that everyone in Indonesia has a tax registration number. Hashim said Prabowo’s main economic priority was to boost infrastructure by spending about $60 billion a year on infrastructure projects. Prabowo will embark on “massive projects,” Hashim said, citing a proposed 10-lane highway running the length of Sumatra. Hashim cited as an example Malaysia, where private and public debt amount to 63 percent of its GDP. Hashim also emphasized that Prabowo was welcoming of foreign investments and foreign investors. The public will get a chance to hear Prabowo’s comments direct in the first presidential debate to be broadcast from Balai Sarbini in Jakarta on Monday. Additional reporting by Kennial Caroline Laia”. Video yang digunakan oleh post sumber adalah hasil suntingan, kompilasi memotong video-video publikasi tahun 2013 dan 2014, diedarkan kembali untuk membangun premis dan framing "Pro asing". Selengkapnya di bagian PENJELASAN dan REFERENSI.